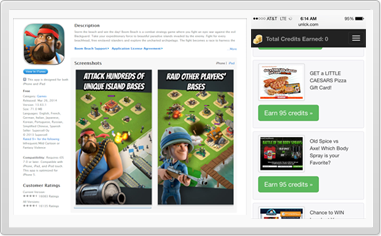 Monetize your apps, mobile traffic, & more with access to thousands of mobile-friendly affiliate campaigns! AdWork Media's Mobile Affiliate Network allows you to better monetize your mobile traffic with high converting mobile offers targeted to your mobile traffic based on their device and country! You can directly link to our inventory of mobile-friendly campaigns, import mobile campaigns from our real-time API feeds, or use our automated mobile monetization tools such as our Offer Wall, Content Locker, & other monetization tools that fully support desktop and mobile traffic. or use our Automated Mobile Monetization Tools! Access the industry's best mobile affiliate marketing programs with the most competitive payouts. AdWork Media works directly with hundreds of advertisers in over 200 countries to ensure we can always provide the best mobile campaigns. Directly link to our mobile campaigns or use our highly customizable mobile monetization tools such as our Offer Wall, Content Locker, Product Locker, & more. These tools automatically target our best offers to your traffic based on their device and country. AdWork Media's support team is available 7 days per week to assist you on our mobile affiliate network. Please feel free to contact us at any time and we can help you find the best monetization solution for your traffic and assist with any integration. Receive real-time conversion notices for completed leads which could send data to your app/site such as the IP address, commission, country, tracking IDs, and other relevant details for each valid conversion. Our mobile affiliate network supports traffic from all mobile devices and we can target device-specific offers to your mobile traffic such as campaigns optimized for Android, iOS, and other popular devices. Do Some Campaigns Support Traffic from any Device? Yes! We have hundreds of mobile optimized campaigns that can support traffic from ANY device. This allows you to monetize your mobile traffic more effectively by benefiting from ad revenue on less popular devices that most networks cannot support. Should I Direct Link or Use a Mobile Monetization Tool? We recommend using our mobile monetization tools instead of direct linking since these tools can automatically target our best performing offers to your traffic. Both methods are fully supported and some publishers choose to use both methods. Can I Import Mobile Campaigns with an API Feed? Yep! We fully support a detailed Mobile Campaign API that allows you to import mobile affiliate campaigns in JSON or XML format that can be filtered with advanced options such as device, country, payout, and other factors.